Last season, Ann Demeulemeester tried her hand at wearable abstract art to purposefully go to an experimental place but today's show was about poetically playing out with familiar elements - feathers, lace-up detailing, fringing - to reach the heights of seduction through what she knows best. We always come out feeling all the more satisfied that what we saw was the sort of high grade consistency that so few manage to sustain and whilst much of what we saw today was familiar, the mythical creatures such as the fawn that Demeulemeester was inspired by to make female crossovers with, provided the vital bit of magic to produce fantastical pieces such as an all over goat hair one-piece that was sprayed with fiery tones. Other animal magic occurred in the placements of feathers in bandolier belts that cris-crossed over the staple Demeulemeester jackets, dramatized at times with velvet. Leather lacings splayed out at the hips, undone and trailing which together with the feather as bullet replacements, had the effect of a warrior women who was at one with the wilderness. Chevron striped beading was also introduced as a more delicate motif, contrasting with the fur and the feathers. Many jewellery designers have incorporated bird claws or other animalistic elements into their work but Demeulemeester’s claws were cast from real ones, a visceral and heartfelt approach, which spread through the collection with a burning passion. Dazed Digital: What prompted this poetic mood, a shift from last season? Ann Demeulemeester: I wanted to get back to my track. Last season was a try out. I was angry and you could feel that. Now I feel better, and that was in the collection! DD: What was the starting point? Ann Demeulemeester: It came from my heart and flooded out. I think it’s my job to give beauty. I started with that. I had this mythology in my head and in the beginning I made this jewellery out of bird’s feet. It was so difficult to make this (motions to the her necklace). I was actually drying out real bird’s claw to cast it. DD: Where did all the fur come from? 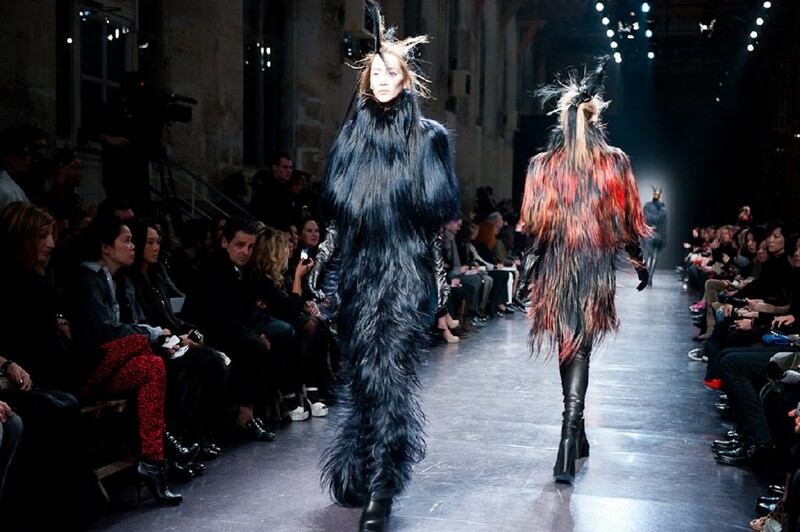 Ann Demeulemeester: I use only furs from animals that are eaten. I really wanted to use goat fur because in my head I had in my mind the creature of the faun. I also thought of other mythical creatures – unicorns – the hair on the models was actually horse hair. DD: Was this about women going into the wild and fending for themselves? Ann Demeulemeester: It’s not about being in a reality. These are the beings between human and nature trapped in beauty.